Tomorrow promises a few inches of fresh snow, so what better act of defiance is there than to enjoy a few spring flowers today? ‘Gerard Parker’ and ‘Wendy’s Gold’, two of the earliest favorites. I probably shouldn’t refer to them as spring flowers, it’s still clearly winter when you look at tomorrow’s snowy forecast and last night’s low of 18F (-8C), but I just feel funny calling them winter bloomers. Winter is definitely not a time for flowers around here. 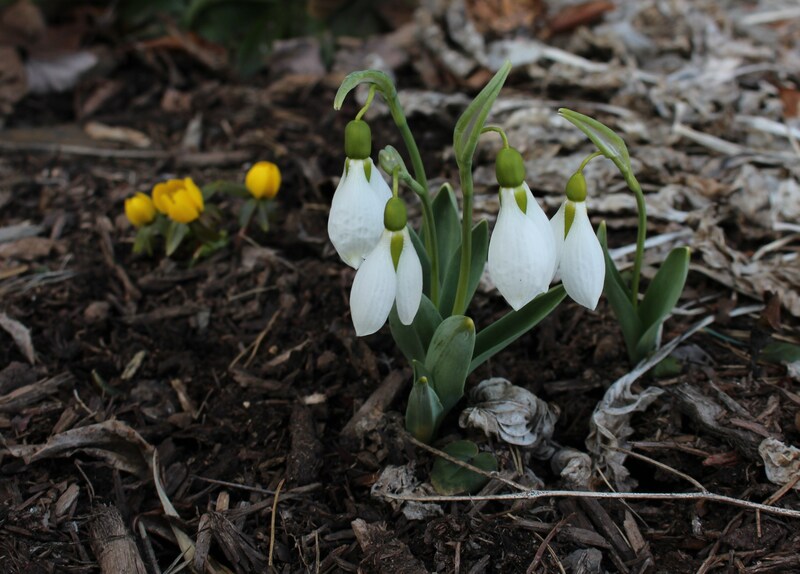 A nice little bunch of the giant snowdrop (galanthus elwesii) with the first winter aconite opening up behind them. Even so, the hold winter has on the calendar is starting to loosen and I for one am fine with that. After snapping these pictures I trimmed a few hellebores and cleaned out the front porch bed so that these new little sprouts could show off to their fullest. I didn’t get much further than that though. The whole time I was haunted by little people asking about a baseball game and whether or not I was done yet. The other snowdrops will have to wait. Some of last year’s forced snowdrops. 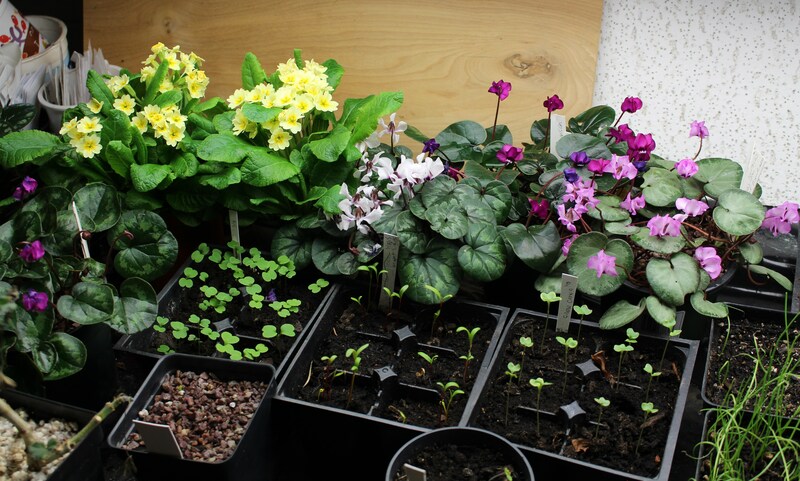 They spent last winter flowering under lights in the garage, now they’re settling in outside. By next year they should make for a nice show in this spot. 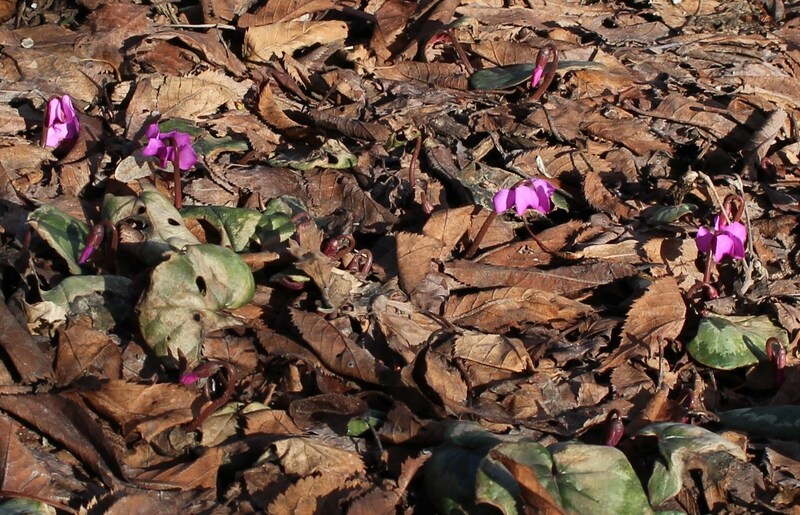 Last year every last leaf on this hardy cyclamen coum was a soggy frozen mess. This year looks a little better and I’m hoping for a nice bright springtime show! 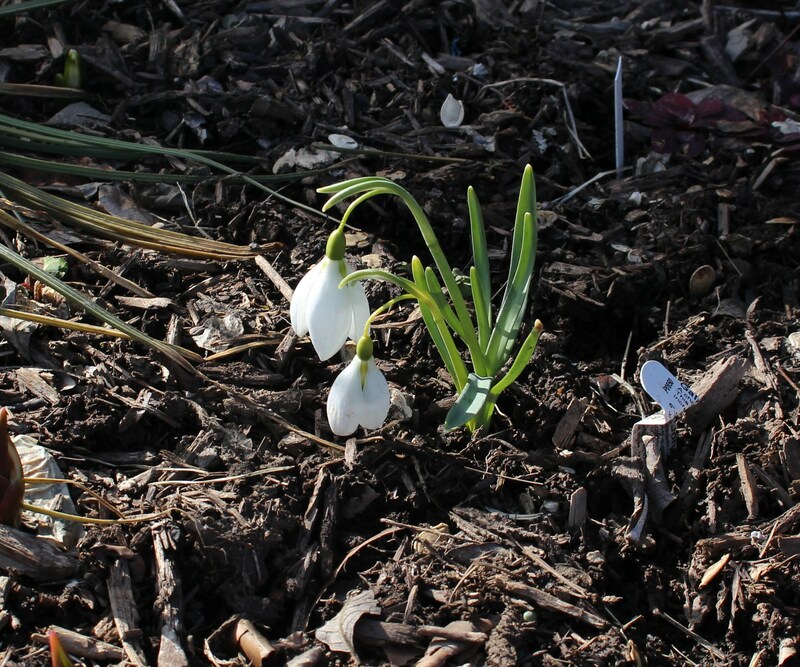 Another first for the year is the snowdrop “John Gray” from Far Reaches Farm out in Washington state. Last winter I enjoyed this one under lights in the winter garden and it doesn’t seem to have minded the time indoors at all. This year it’s on Pennsylvania time and is blooming much later of course. Look, another white snowdrop. FYI for all those snowdrop snobs out there, it’s galanthus “John Gray”. The rest of the snowdrops are still laying low. I’ll try to show restraint in the coming days as they open up but I’m not making any promises. It’s been a long winter and it’s not just the birds who are singing a springtime song! Cool weather vegetables are on their way in the winter garden. The last cyclamen are shoved to the side and the few sad little snowdrops have been kicked to a windowsill to make room. Even my treasured yellow primroses had to step to the side. In all honesty the weather is rarely warm enough for the real spring bulbs such as crocus and hyacinths until the last week of March, so even with our February snowpocolypse we really aren’t much off from a normal year. Still I would have been fine with an early spring, and I’m sure you’ll join me in wishing for even more sun and warmth! This entry was posted in cyclamen, late winter, snowdrops, spring bulbs and tagged flowering bulbs, galanthus, garden, late winter, snowdrops, spring flowers. You had me at “four warm days without snow cover.” Now I am jealous. 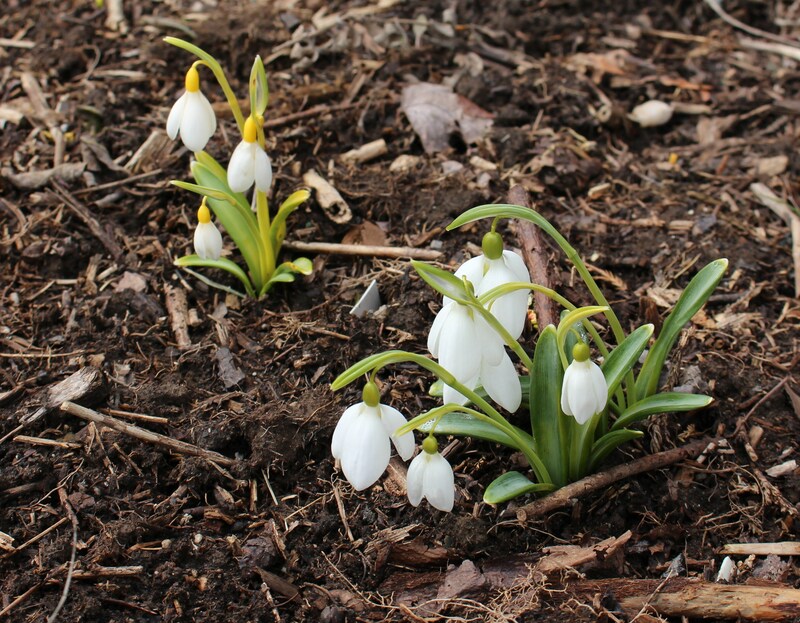 I did see my first snowdrop today, thanks to the stone front walk melting the snow on one side, and my fortuitous planting of some snowdrops there. It’s still got it’s nose in the air, but I’m calling it blooming anyway. I would call that a bloom as well! After the weather we had in February, “four warm days” has a whole new meaning. It went up into the 40’s and I was out in a T-shirt! Oh yes, I do wish you some warm sunny days Frank. In German there is a word for early spring which it seems doesn’t exist in any other language as a defined term: Vorfrühling. Wikipedia says it is mid-February to the end of March. 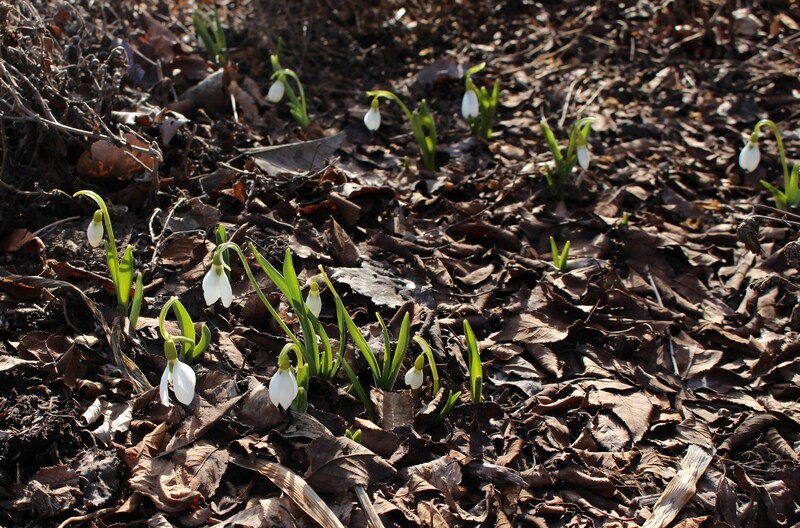 So you can say it is early spring where you are without any qualms – despite the weather! Lovely to see your snowdrops blooming outside. It is actually officially Spring now. And yet more snow to come? Oh dear, back to your garage. I am in the garage this afternoon. The kids are outside playing in the snow with their sleds while I try and clean things up a bit in there. I need to get ready for the very second this latest mess melts! Happy Spring! It’s so nice to have a chance to spend those first few minutes cleaning up a garden bed, anticipating the season. I’m going to wish you a happy spring (officially it has arrived) despite the promised snow I’m sure spring really is arriving for you at last- enjoy every moment. These are the days I’ve been waiting for! I think the anticipation is almost more exciting than the actual arrival… you’re so busy when spring comes there’s often not as much time as you would like to have in order to enjoy it. Now I can at least sit back and think! Maybe today will be the last of the winter weather? March did come in like a lion, so, darn it all, it had better leave like a lamb! Like snowdrops, winter aconite has never grown for me up here. When I lived in Albany, my neighbor had a backyard full of it, and it often bloomed and looked like a sea of yellow over there on the first relatively warm, sunny day in February! I hope this is the last. No warm days without snow cover here…still a foot of snow but how lovely to see your spring blooms. Can’t wait to see mine maybe in April as the weather forecast has us cold still so no great melt. I hope that once it gets warm for you the thaw happens quickly, hopefully somewhere just under messy flood but far faster than slow as paint drying! It’s snowing here as I type… on the first day of so-called Spring. *sigh* They say 3″-5″ but I hope they are overestimating. Say… do I spy a few winter aconite in the background of the first photo?? Well they didn’t overestimate here…. we have plenty of the white stuff again and I’m as thrilled as you are. But I do feel a little better knowing something is in bloom under the snow just waiting for it to melt off! I was lucky enough to have it in a spot it enjoyed before moving it to all the spots which it clearly does not enjoy. Hopefully I can find it a happy home again before all of them die off! I heard even more birds singing this morning (as the snow continued to fall…) so I guess they do know something! We are supposed to go back into the teens next week. Apparently winter does not hear me when I tell it to get lost. I’ve killed off more than my share of bulbs…. But eventually a few take hold, and once they take off, look out! It’s one degree below freezing here this morning, and flurries are predicted for later this afternoon. But I am mostly unfazed, a lot of clean up occurred yesterday, and the snow is unlikely to stick. I covet some winter aconite, though! I just saw thousands of winter aconite naturalized in a park. It’s an awesome sight and makes me want them all over too! I saw you’ve gotten a start on the cleanup. I think things might be finally starting to look up spring! Seeing snowdrops bloom is such a special time, it is the first time each year that I can let myself believe that spring has really arrived. It is the time I start looking for green shoots in the garden and the unfurling of leaves on the shrubs…It is such a grand time. Isn’t it a great feeling to see all that! I also spend way too much time shuffling around outside examining every shoot and admiring every bud. The neighbors must be shaking their heads but I love it.